Living in the Caribbean, we are fortunate to enjoy year-round warm, tropical weather. People come from all over the world on holiday to soak themselves in our gorgeous sunshine. But among all the hot bikini bodies (yes, even the Victoria’s Secret models known to frequent these parts), I have to say the most beautiful to me by far are… you guessed it – the toucans. 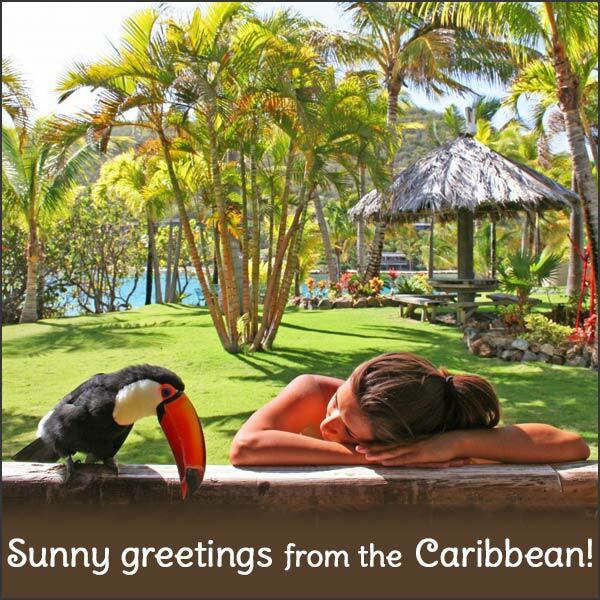 Our toucans, like any living thing, need sunshine to live a healthy, happy life. Due to our temperate climate, they are lucky to live outdoors all year round. While their aviaries are designed to protect them from the elements, they also allow for periods of sunshine inside, depending on the sun’s position throughout the day. In the picture above, Pepe is enjoying his morning sunbathing session. You can see how they tilt their beak towards the sun, making it appear as though it’s glowing. They also love to spread their wings slightly, to allow their body to feel the warmth. Pepe is particularly entertaining to see – with his wings spread and head tilted, it almost appears as though he’s wearing a cape & cackling, like Dracula. It also makes me laugh how much they remind me of some bronzing beauty, making a point to switch sides at regular intervals, almost as though they are trying to ensure they get an even tan! And the best part about being a sunbathing toucan? You don’t have to wear sunscreen and no – you never burn yourself into a lobster. This entry was posted in Enclosures, General Info and tagged beak, cages, Caribbean, Pepe, sun, sunlight, sunshine, Toco, Toucan, toucans, vitamin D, wings by Toucan Lady. Bookmark the permalink.